Back in June, some folks in our church (MeRF = Messiah’s Reformed Fellowship) headed out to Pennsylvania for a getaway at Kirby House, a beautiful old house that was once used by the Kirby family as their summer home in the mountains. It was really great to spend some decent time with church folks. Our church is a commuter church so most of our fellowship times happen on Sundays because it is so difficult to get together during the week. So, having a weekend to spend time together was great. I didn’t take many photos, which is a shame because the grounds are gorgeous, but I was spending time with people instead. I handed my camera off to someone else to take the real photo — this one was me getting the settings right — but the ‘real’ photo didn’t turn out, so this is the best I’ve got! We had some good talks led by Pastor Murphy, time for swimming and walks, and just hanging out enjoying each other’s company. We also had a talent evening, which was fun! 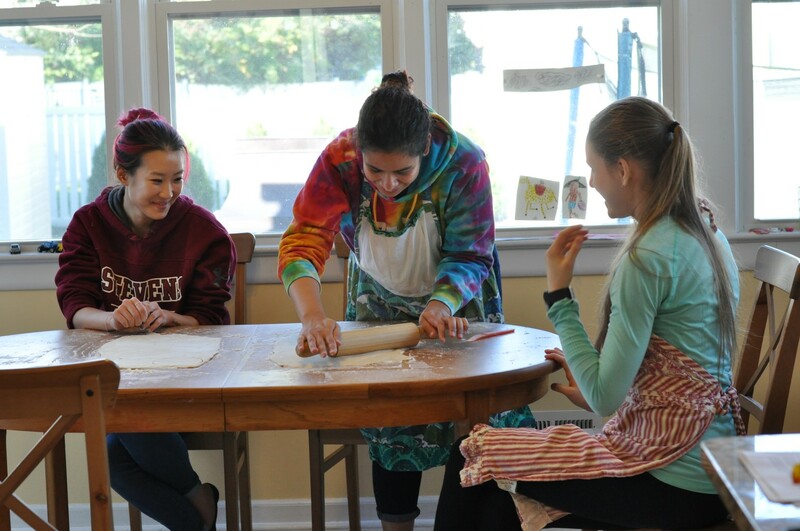 Back in mid-November I had a few girls from church over at our house for a pie making day. We worked hard, had lots of fun and got to enjoy some pretty yummy pies. Oh, and here’s a little confession: even though some of these recipes have directions for the pastry, I have yet to make a pastry that rivals store-bought pastry. Maybe I need more practice, but until then it’s store-bought all the way! Sautée the onion until it starts to brown, then add the garlic and fry for a minute or so before adding the spinach. Cook until heated through, then add cream cheese. When the cream cheese has melted and been incorporated, sprinkle over the flour, and stir it in until well mixed. Fry for a minute or so, then add the milk and cook until thickened. Season with salt and pepper, and take off heat and stir in the cheddar cheese. 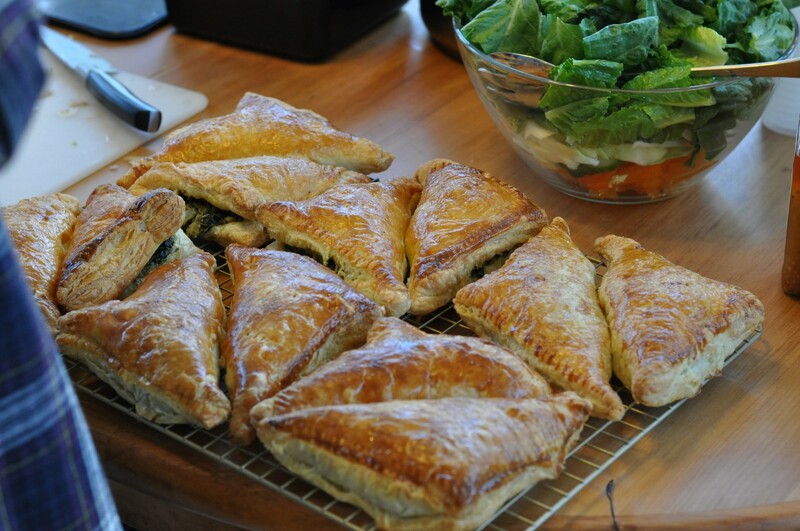 While the mixture cools, lay out the sheets of pastry and cut each sheet into 4 squares. 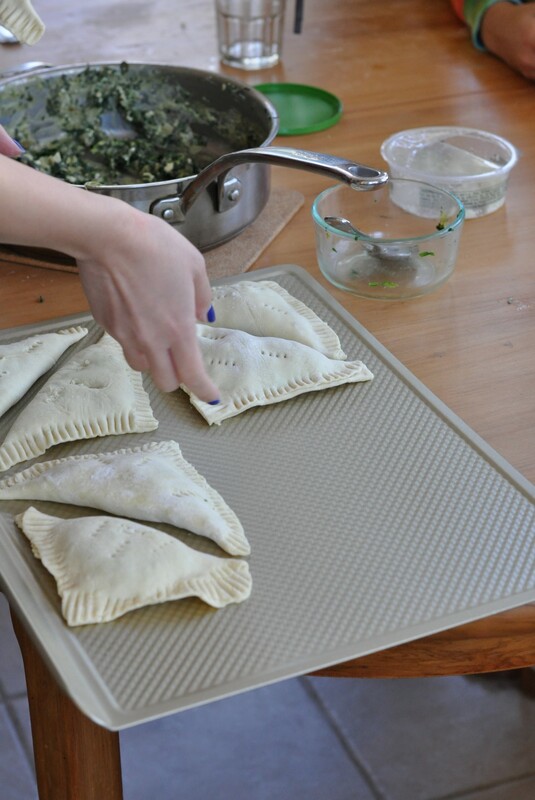 Place spinach mixture on a triangle half of the square, making sure to leave about an half inch margin on the edges. 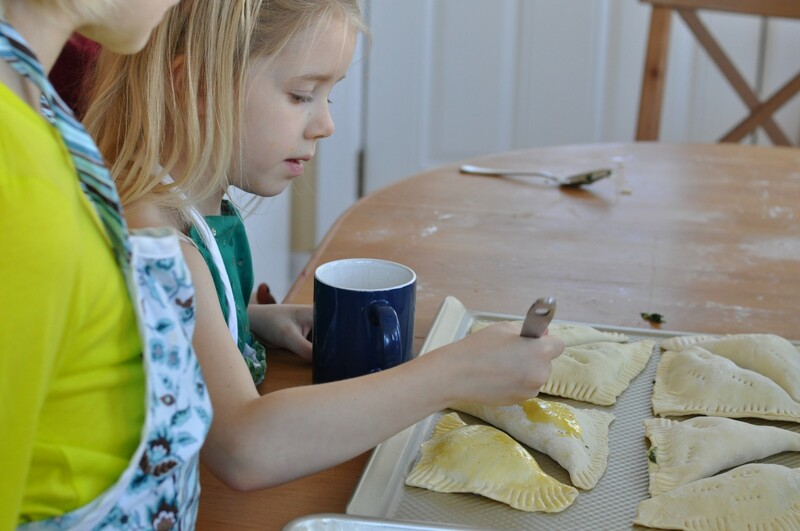 Fold the pastry over and seal the edges with your fingers and then press down with a fork. Stab each pastry lightly about 3 times with the fork (this helps the steam escape as it is cooking). In a small bowl, whisk an egg and use a pastry brush to brush egg over the pastries. Bake for 20 minutes, or until golden brown. Sift the flour and salt into a large bowl. Roughly break the butter in small chunks, add them to the bowl and rub them in loosely. (Or use food processor with blades) You need to see bits of butter. Make a well in the bowl and pour in about two-thirds of the cold water, mixing until you have a firm rough dough adding extra water if needed. Cover with cling film and leave to rest for 20 mins in the fridge. Turn out onto a lightly floured board, knead gently and form into a smooth rectangle. 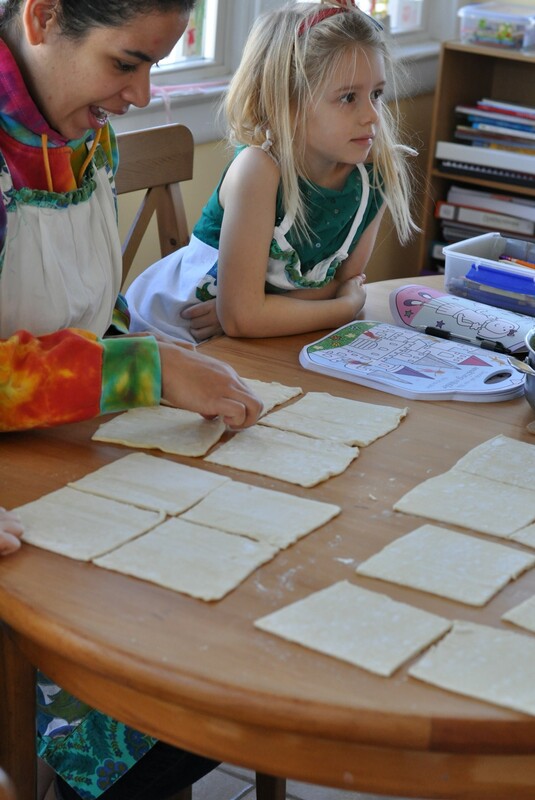 Roll the dough in one direction only, until 3 times the width, about 20 x 50cm. Keep edges straight and even. Don’t overwork the butter streaks; you should have a marbled effect. Fold the top third down to the center, then the bottom third up and over that. 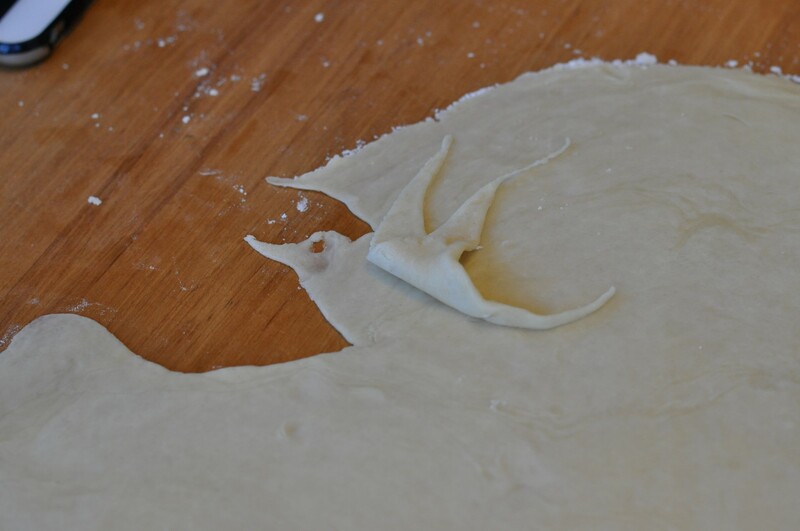 Give the dough a quarter turn (to the left or right) and roll out again to three times the length. Fold as before, cover with cling film and chill for at least 20 mins before rolling to use. 2 lbs stew beef (like chuck roast), cut into 1 inch cubes. Preheat oven to 275 °F. In a Dutch oven, fry one large onion with bacon and garlic until browned. Add beef cubes and brown the meat. Add the mushrooms, salt and pepper, parsley and cook for about 5 minutes, then add the wine. Place the Dutch oven into the oven and cook for about 3 hours, until the meat is tender. Place on the stove on low heat. Mix corn starch with cold water until no lumps remain, then stir into the stew mixture and cook for a few minutes until thickened. Take off the burner and let cool. Prepare the pastry in the pie dish (you can do a bottom layer as well as a top layer, or only a top – whatever you prefer), spoon in the filling (you might have some left over), and dot with the cheese. Put the pastry lid on and seal. 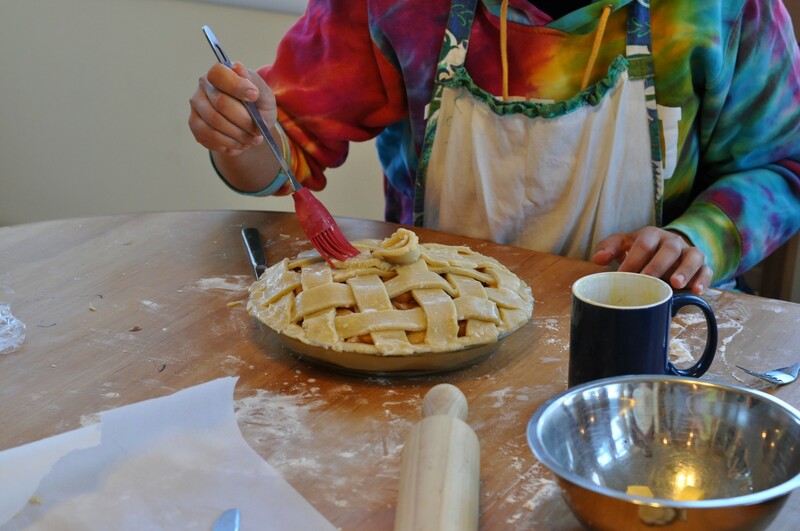 Place the pastry over the top of the pie dish and criss-cross it lightly with a sharp knife. Brush the top with beaten egg, then bake the pie directly on the bottom of the oven for 45 minutes, until the pastry is cooked, puffed and golden. Place the peeled and quartered potatoes in medium sized pot. Cover with at least an inch of cold water. Add a teaspoon of salt. Bring to a boil, reduce to a simmer, and cook until tender (about 20 minutes. While the potatoes are cooking, heat the oil in a large sauté pan on medium heat. Add the chopped onions and cook until tender, about 6 to 10 minutes. If you are including vegetables, add them according to their cooking time. Carrots and celery should be cooked with the onions, because they take as long to cook as the onions do. If you are including peas or corn, add them toward the end of the cooking of the onions, or after the meat starts to cook, as they take very little cooking time. Add ground beef to the pan with the onions and vegetables. Cook until no longer pink. Season with salt and pepper. Add the Worcestershire sauce and tomatoes. Bring the broth to a simmer and reduce heat to low. Cook uncovered for 10 minutes. When the potatoes are done cooking (a fork can easily pierce), remove them from the pot and place them in a bowl with 4 Tbsp of butter and milk. Mash with a potato masher, and season with garlic salt and pepper to taste. Preheat oven to 400°F. Spread the beef, onions, and vegetables (if using) in an even layer in a large baking dish (9×13 casserole). Spread the mashed potatoes over the top of the ground beef. Rough up the surface of the mashed potatoes with a fork so there are peaks that will get well browned. You can even use a fork to make creative designs in the mashed potatoes. Place in a 400°F oven and cook until browned and bubbling, about 30 minutes. If necessary, broil for the last few minutes to help the surface of the mashed potatoes brown. 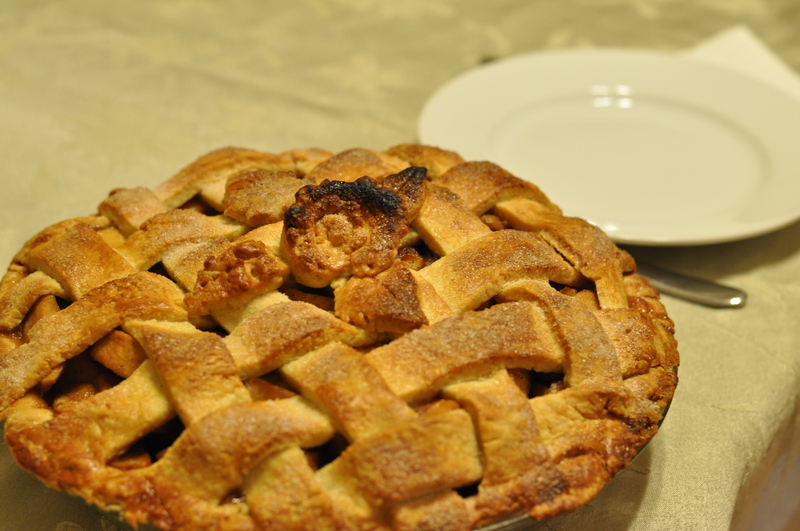 Note: You may freeze the uncooked pie, but don’t brush it with egg or dust it with sugar beforehand. 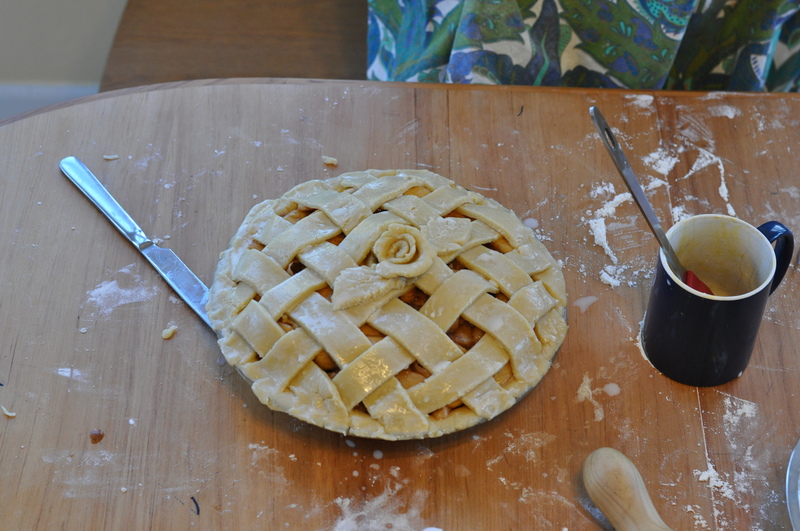 Place the pie in the freezer for 30 minutes, to harden it slightly, and then double wrap it with plastic wrap. Freeze for up to 6 months. When ready to bake, unwrap the pie and brush it with egg and sprinkle with sugar. Bake, from the frozen state, until golden brown, about 1 hour and 10 minutes. Mix sugar, cinnamon, salt, ginger and cloves in small bowl. Beat eggs in large bowl. Stir in pumpkin and sugar-spice mixture. Gradually stir in evaporated milk. Pour into pie shell. Bake in preheated 425° F oven for 15 minutes. Reduce temperature to 350° F; bake for 40 to 50 minutes or until knife inserted near centre comes out clean. Cool on wire rack for 2 hours. Serve immediately or refrigerate. Top with whipped cream before serving. 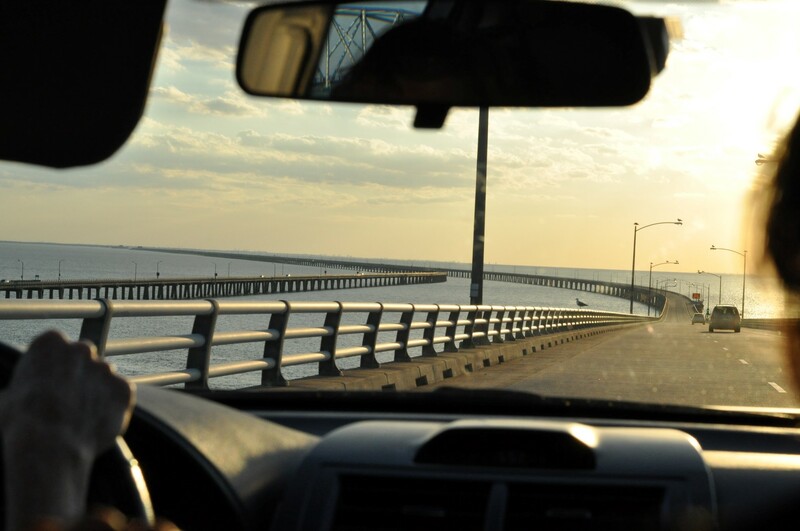 A couple of weekends ago, I had the amazing opportunity to travel down to Virginia Beach for this year’s CCEF (Christian Counseling and Educational Foundation) Conference. 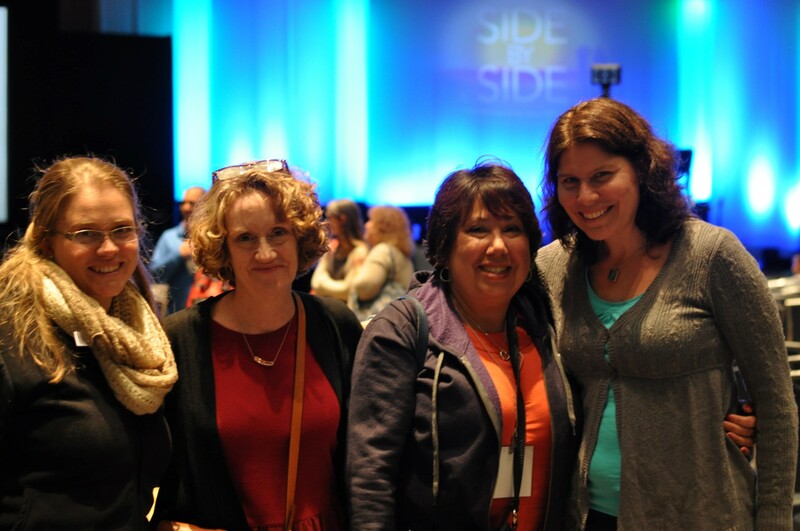 The topic of this year’s conference was Side by Side: How God helps us help each other. I was incredibly blessed by the speakers who were knowledgeable and so humble in their presentations. I learned so much, and grew in my understanding of how I could come alongside others in their walk through life’s difficulties — not with all the answers, but to be there with and for them. I drove down to the conference with 3 friends from church. It was a really beautiful drive! I was really thankful that we drove down instead of flying (not that that was really an option), because it gave us a total of about 16 hours’ worth of talking time in the car (plus more over the time we were there!). Conversation ranged from serious to hilarious, and I don’t think I’m exaggerating when I say there was no more than 15 minutes of total silence during our trips! I’m thankful that I could get to know Julie, Naomi and Jen better — to learn from them, to laugh with them (there were some gut-splitting laughing times), pray with them, and just enjoy them. I don’t know how much longer this will be available online, but for now you can view many of the sessions here. If you don’t have hours to dedicate to watching these, and want to choose just one, then choose the first talk by Ed Welch on Our Neediness Is God’s Gift. I have often felt ill-equipped to help others because of my acute awareness of my own failings and struggles. And then the very first session I get told that my failings and struggles — my neediness — is something that I should even grow in, that when I feel inadequate and weak, that’s a perfect start for ministry. Because having a keen sense of my own neediness eliminates a lot of potential hurt because I’m not approaching others with an “I know what you need” mentality. It made me realize that my feelings of inadequacy and my failings are not and should not be a hindrance to walking alongside others in ministry. In fact, it is necessary and beneficial. It was such a blessing to hear that! Oh, I should add a little something about our nighttime excitement. The first couple of nights we had super loud planes from the nearby Air Force base. On the night we arrived, we were unloading the car when one of them flew over us and it shook everything — I thought the plane was about to crash on top of us, it was so loud! 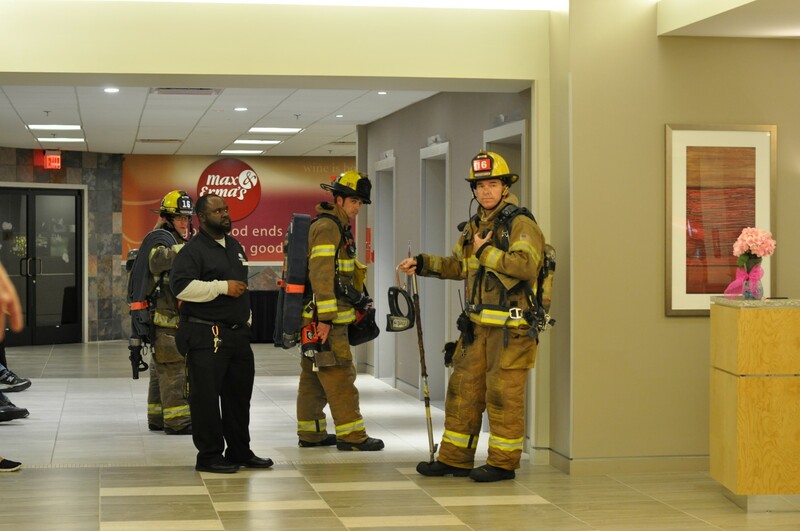 Then, on the last night we were woken up by the hotel’s emergency alarm. Let’s just say that it’s very disorienting to wake up to that sound and to then think clearly enough to throw on some shoes and a jacket and grab your valuables. Yes, I know, you’re not really supposed to do that… but I did. I’m such a rebel. We went outside with the whole rest of the hotel and stood outside in the cold in our pajamas waiting for the fire department to arrive. They came and we were eventually allowed to wait in the lobby. After a long wait, we were given the all clear. We went back to our rooms, got nicely settled in bed, switched off the light, and then literally 2 seconds later the alarm went off again (!). Both times turned out to be a technical fault (or that is what we were told, anyway). Still, a fun little add-on story of the weekend! 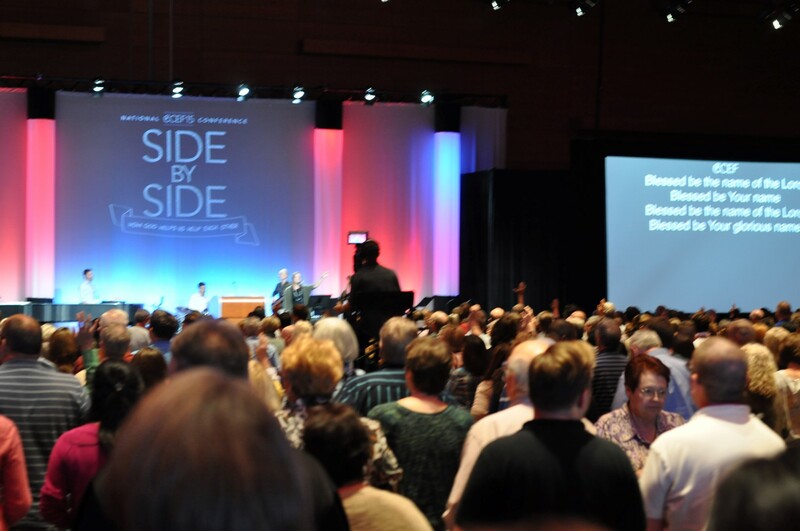 If any of you ever have the chance to attend one of CCEF’s annual conferences, I’d highly recommend it! Next year’s conference is going to be on the topic of emotions, and is set to be in Chattanooga, TN. Yes, you too can Do It All! Small children? A big workload? Stack of dishes in the sink? Pile of bills to pay? No problem! Just follow my easy 3-step program and soon you too could be one of those special people who can Do It All! 2. Hire a nanny, cook, housekeeper and gardener. 3. Put yourself, your dreams and ambitions before anything or anyone else. I was asked recently to give a talk at a women’s Bible study about “something I’ve learned from life as a Christian woman/wife/mother with the other women”. I thought they got the wrong number. Uh, I’m not sure I’m the right person for this… I tried to get out of it, but as I prayerfully considered it, I thought there might be something I’ve learned. Actually, it’s more accurate to say that I’m currently learning this lesson: How Not to Do It All. Since giving the talk a couple of weeks ago, I’ve thought of all sorts of edits to make and ways to say it better, but I’m in the thick of getting ready to pack my life in the US up into 4 suitcases, so it’ll just have to do as it is. Below is the written version of what I talked about. 2. At different times in life, and by working hard. b) you feel just a little too pleased with yourself because you’re not struggling like her. At least your kids don’t behave as badly as her kids. Pure unadulterated, stinking pride. First off, no woman “does it all”, and if she’s making it look that way, she’s either faking it or has some serious help. Maybe we have this idea in our heads that such a thing is possible because we take all the great qualities we know of all the women we know and think we should channel all those qualities. Or perhaps it’s the Perfect Proverbs 31 Woman who makes us look at ourselves and cringe. (I’ll talk more about that Proverbs 31 Woman soon.) Or maybe we are concerned with this because at some root level we are desperate that our lives here on earth be meaningful and not wasted, and for our lives not to be wasted we have to do everything and do it well? Or maybe it has subtly become a great big idol taking over your life. Here’s a little exercise: think of someone you actually know (not someone you only know through her writing) and of one or two qualities you really admire about her. Let’s say, for example, that you think she’s a really good cook, because the one time you’ve eaten at her house the food was fantastic. Now you have this idea in your head that this is the way she always cooks for her family and that eggs on toast for dinner or a hot dog slapped in a bun with some ketchup and mustard hastily squeezed on would never appear on the menu at her house. Guess what — 5 o’clock melt-downs quite likely happen at her house too. You’re not the only mother in the world who has served a hasty dinner on occasion that had no vegetables in sight. Now, if this happens frequently, you have some work to do, but don’t beat yourself up and compare your hot dog meal with that woman’s 3-course special meal that she planned 3 weeks in advance. To be realistic, there are some things that you’ll do more naturally and some things need to work at a fair bit. But do just that — work at it, don’t mope because you can’t do it the first time you try. Some women love to knit and crochet. Yes, this is a great thing, but it’s not for me. I’ve tried. I’ll probably keep trying when I have some more time, but that time is not now. I once tried making a quilt. It looked like an 8-year-old made it, but Marica still loved it. I think quilting is something I’d enjoy when life has mellowed me a bit and I have a bit more patience. 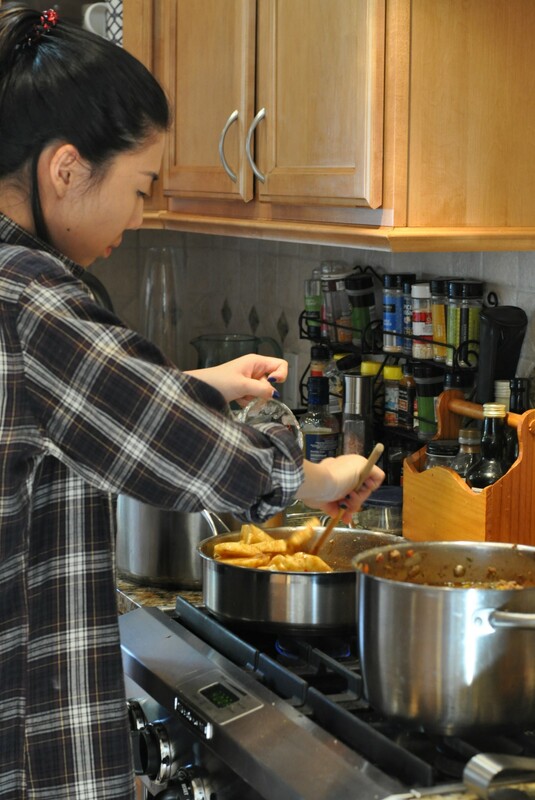 :-) I love to cook and I love to spend time with people, so our family puts a lot of emphasis on hospitality. Just because you aren’t a good cook isn’t a good reason not to be hospitable, but don’t feel like you have to put on a feast. In other words, look at yourself realistically, and know where your strengths and weaknesses lie. Look at your situation in life realistically and decide where you should spend your time and energy. Pray about it, and get your husband’s useful input — men can sometimes see these things more clearly. As you go through life, your workload will have some ebb and flow. You’ll always have work to do in, around and outside your home. Do it cheerfully and well. The work you do when your kids are little is going to look different from the work you do when they are teenagers, or when your nest is empty (that day looks unimaginably far away to me, but people keep telling me it comes quickly!). Life brings different chapters, and in each chapter of life you’ll have different challenges and different things you are really on top of. Be realistic — know what chapter of life you and your family are in at the moment and think about what your main priorities are. Focus on doing those well, and anything extra is a bonus. If you’re saying yes to being on committees at church or your kids’ school because you think you’re supposed to, but it frazzles you out and it means you snap at your kids and you don’t get your laundry done, then scrap it. Don’t be surprised if you find yourself constantly busy, and working hard. This is a good thing. You should work hard, but your workload should be manageable. Have you got a house full of little ones? Then know that your time and energies are needed and wanted at home, and that all you’re pouring into them is so, so valuable. You don’t need some sort of ministry or special calling outside the home — your ministry and calling is right there in the high chair and it has squishy cheeks and needs a clean diaper. When you’re out of this busy phase of having little ones, you might look into working part-time, or volunteering somewhere or joining committee X. If you have a look at the Proverbs 31 woman, you’ll notice that she works very, very hard. Yet it would seem impossible for one woman to take care of her household and still do all those things, even with servants. People have suggested that she’s an ‘idealized’ woman, making up good qualities from many different women. Or it could be that she does all those things, but at different times in her life. While it is very valuable to look at what she does and try to do the same, perhaps you’re not the kind of person who’s going to start making stuff out of flax. I think it’s more valuable to look at how she works: she works with eager hands, she does it vigorously. She’s described always doing: she gets up, she considers, she makes, she speaks, she watches. Use your time wisely, and work hard, be a blessing to your husband and children; all to the glory of God. My kids know that they should obey straight away, all the way, and with a happy heart. Think of yourself in relation to the work you need to get done in the same way. If you don’t have a good work ethic, read good books to help you cultivate it, or talk to someone who can help, encourage and even mentor you on that front. Thirdly, plan! I just mentioned using your time wisely –you can not expect to be very productive if you spend a few hours every day checking out Pinterest, Facebook, the news, twitter, or even really valuable blogs and articles out there. Spend not only quality time with your children, but quantity time. Your kids are more important than “getting things done”. (Boy am I preaching to myself here!) If you have thought about what your priorities are, then how you spend your time should reflect this. Now, life happens and if you don’t actively plan for your priorities to happen, they might well fall by the wayside because let’s face it, when you’re tired it’s easy to slip in to time-waste mode, and mothers are often tired! Plan to read the Bible and pray. You might do this while nursing the baby, or if things are desperate, lock yourself in the bathroom for 5 minutes. Take time to look around you and be thankful for where God has chosen to place you. If you’re in the thick of mothering, you might not be at a stage in life where you’re spending an hour on Bible study every day, and that’s fine. But don’t let it slip completely. Do not neglect your relationship with your husband. Fiercely guard your time together to talk and reconnect. Plan to have date nights regularly, even if you have to make them in-house date nights where you put the kids to bed and then order in some take-out just for the two of you. Plan to sleep. If getting to bed at a decent hour is not a priority that you fight for, then chances are you won’t get to bed at a decent hour! I find that I function badly without sleep and am a lot more prone to sinning when I’m tired, so I need lots of sleep, sometimes even an afternoon nap. Plan to carve out time for things that rejuvenate you as well — little pockets of precious time of figuratively (and sometimes literally!) taking a deep, cleansing breath to get you ready to jump back in with a happy heart. Exercise. Sing. Skip down the road with your kids, or splash in the puddles with them. I try to meet up with a couple of good friends at The Chocolate Room (a dessert place where everything’s chocolate) about once a month. We talk our heads off and come out feeling heavy in the stomach and light in the heart. Use a diary! Anyone who can operate without a wall planner and/or diary is either amazing or highly disorganised. A diary is your friend. Plan things out, even housekeeping chores that should happen on a weekly basis (though it’s a good idea to plan for more thorough cleans every few months too). If you’re really in the thick of life, then writing down things like ‘sweep the floor’ and ‘clean the bathroom’ every week in your diary is a totally acceptable. Recently it took me an entire morning to strip and remake the 3 beds in our house, because I was being interrupted the whole time with little people and little problems, many of which involved bodily fluids. This is normal if you’re in the stage of life where you’re living with little ones, though there are days it can feel discouraging to get to the end of your day and wonder what on earth you did all day — you know you were busy the whole time, but what were some actual things you did? If you can then go to your to-do list and tick off ‘fold laundry’ and ‘read to kids’, there is a sense of satisfaction, as silly as it seems. Plan your weekly menu, and shop accordingly. Not only will it save you time and money, it’s good for your sanity because you don’t have to get to 5 o’clock and wonder what on earth you’ll feed people tonight. Read literature that will challenge you, but also encourage you. Read books that will help you and encourage you in your marriage, in mothering, or other areas of life. Read some fun fiction too in between or about other things you’re interested in! I’m not in a stage of life where hours of sweet quiet reading time is available to me, so I’ve taken to reading short stories, or books with short sections that I can read just a little bit at a time. I could go on, but you get the idea. To wrap things up, remember that God created you with your own unique set of talents and abilities and situation in life, so don’t try to compare yourself to other women. Work hard at things that are a priority in your life, plan your time and use it wisely, and work cheerfully. Femina (you should just read the whole thing, and everything in the archives (I’m not kidding), but here are a few recent ones that I found very helpful): The Littleness of Motherhood, Domestic Kindness, You make me feel so guilty!, and False Comfort. Clover Lane: I don’t know how she does it all. The Power of Moms: Your children want YOU!